With the cost of furniture getting higher all the time, many people are opting to build their own and are learning how to build a twin bed. This is not always as easy as it sounds, however, if you have the right tools and are good at following directions, you might be surprised by what you can accomplish. You'll need good, sturdy, dependable lumber to build a bed. It's a good idea to buy a little more lumber than you actually need for any woodworking project. This helps in case you find a defective piece or in case you make a major mistake in cutting. The bottom and end boards will be cut from the 4 x 8 sheet of plywood. The first cut will be 39 inches wide by 75 inches long for the bottom bed board. From the remaining plywood, cut two 8 inch by 39 inch end boards. Now cut off each corner of the bed so that the bed posts fit snugly. You'll need to make a 2-1/2 inch notch in each bed post to accommodate the mattress. Space two bed posts 75 inches apart. Place one of the 1 x 8 side boards over the posts, making sure the top of the board and posts are even. Drill pilot holes for the wood screws and screw the sideboard onto the posts. Do the same for the other side of the bed. Next, turn the frame over and attach the rail between the legs, 2-1/2 to three inches from the top of the side board. Space the rails according to how thick your mattress is. Do the same for the other side and attach the end boards using the wood screws. Now that you have the frame assembled, you can begin sanding the wood to prepare it for painting or staining. For an extra decorative touch, you can buy finials to attach to the posts. The finished frame is designed to fit a standard 39 x 75 inch twin mattress. An alternative twin bed frame that you could build yourself would be a platform bed frame. The difference between a standard bed frame and a platform bed frame is that a platform frame is designed to support a mattress without the need for a box spring. The base on a platform bed is a raised, flat, hard horizontal surface. See an example of how to build a platform bed. Another popular style of twin bed that you could make for a girl's room is a canopy bed. This would be slightly more complicated than a standard twin bed or a platform twin bed. If you like this style of bed and feel confident enough to give it a try, you can purchase plans for a twin canopy bed. Custom twin beds for kids can be adorable and quite expensive. If you are an experienced woodworker and have your own shop or work space, you can find plans to make a custom bed for your son or daughter. If you have a little princess, she would love the castle bed. This elaborate bed has two twin towers at the head of the bed and the sides look like an arched bridge. You will need several different types of saws, like a jigsaw and a scroll saw to cut the plywood frame. Once your children outgrow these types of beds, you could put a little extra cash in your pocket by selling them. 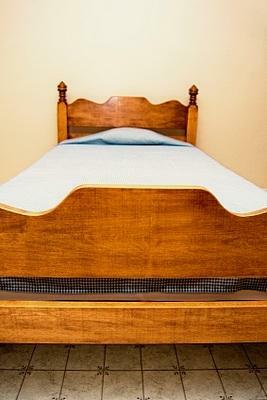 Whatever type of twin bed you decide to build, learn how to build a twin bed that is appropriate for your skill level.